Every once in awhile a book comes along that is not only important, timely and relevant, but also so well-written that you just can't put down. Words cannot begin to explain all the emotions this novel has brought up in me. The Hate U Give is a book I could talk about forever. I recommended it to everyone I came across just so I could talk to someone while I read it. It is heart-wretching and honest. Angie Thomas has created an important piece that should be in everyone's hands. What makes this book so powerful is the instant connections to Starr the reader feels. From the first page, the reader is thrown into Starr's world, her emotions, her conflicts. She is relatable and it I instantly wanted to know more about her. In so many words, it brought me into a world that was both familiar and at the same time unknown to me while opening my eyes to ideas I never considered. As a teacher I have known Starr and Seven. Those young adults with similar struggles,obstacles, and strengths. In many ways, this made me love Starr not only as a character but as a person.Starr is strong and vulnerable at the same time, she exhibits such courage while caring so many fears on her shoulders. Starts struggles are real, her internal struggles are real, and her day to day life reflect the current issues in our society today. I wish I had had The Hate U Give, to show that that their voices matter. Real life is not perfect, problems are not solved in 30 minutes. Life and death situations don't only occur in dystopian novels, but happen every day across the country. As a teacher I have also known Chris's and Haileys- even adults. Each character has a purpose to drive the story, some will make you angry, some will make you want to cry, but they reflect people we see in our every day lives. On a lighter note, the pop culture references woven throughout the book bring an additional touch that also strengthens the story. Angie Thomas has written a story that not only engages the reader but creates an environment for discussion and thought. This book is not just a story but an experience. One that should be discussed and shared with friends. It goes to the heart of issues that need to be known and addressed. 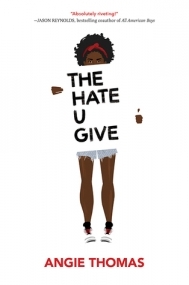 The Hate U give brings a voice and heart like no other book. A standing ovation for Angie Thomas. Highly recommended. I really wanted to be articulate here. I wanted to make sure that I didn't say anything to sway anyone from this book. I wanted to make sure that I did the book justice. I had so many, "I want to make sure's," that I almost talked myself out of writing this review completely. Because, this book is so important. There are young black girls everywhere looking for this kind of novel, looking for a story they can relate to, and although I am not as important as I wish I were--I want these black girls to see this review and to realize that, yes, this book is for them--that, yes, their story matters, too! I initially struggled with this book. I know that seems kind of contradictory to my previous statement. But, let me explain. I'm not naive. I knew that black people were being killed. Regularly. Consistently. And, often times by police. It's hard to hear for some sensitive ears, but it doesn't make it any less true. I've lived in this reality all of my black life. But it wasn't near me, it wasn't tangible because I couldn't see it. Not, until the birth of a camera phone. Technology is a necessary evil. Now, we (I) can physically see the harsh reality of these police-related deaths--it's in our face. Now, it's apart of us, apart of me. So, with that being said. I've grown somewhat desensitized to these types of deaths. I see it on TV, and on the newspaper and I groan. I think, "Not another one." It doesn't take away my anger though. I am just as angry from death to death. But it's so frequent that I think I lose connection to each story. To each life. It's sad, and I feel sort of shameful about it. But, it's true. So when, Khalil was killed in this novel. I wasn't moved to tears, but I was bothered. It made me think about how connected I am to my community, but that's another story for another time. The point is, I thought maybe, because, I wasn't moved emotionally--that I wouldn't be able to connect with this story, in the way that I should. This story is so important--and I did connect with it, on so many levels. Let's talk about the characters. Starr is someone I know, or someone I knew growing up. She lives in the ghetto, and she goes to a fancier school. That was me. That was my friends. That was someone I knew. It's not necessarily where she lived, it's how she lived--split between two sides of her personality, wanting to be black in most situations, but not too black in the others. If that isn't the story of my life. Especially as an adult, if my voice is a little too loud, or my verbiage a little too ethnic--I was always afraid of how it would be perceived. Not wanting to stray too far from each side of my brown faced coin. So, I related to Starr totally. I think it was this, sort of dual life, that she lived that connected her to me the most. Her family. Boy, I loved this part of the story the most. I LOVED the family dynamic in this book. It was so homey, it was like walking in the house and smelling the hot comb on the stove, and the mac-n-cheese in the oven. I found myself unconsciously smiling multiple times reading this book. Simply because this family was so like my own--in their mannerisms and their way of life. I wasn't fortunate to have an active father in my life, but if I did--I'd want him to be like Starr's dad, Maverick. I could go on and on about the family--but, what I will say, is that, it is so integral to this story--and so very well done. Thank you, Angie--for creating this well-rounded and put together family. That no one can call the Huxtibles, but, one that no one can say, is not a "real family." I was worried. The friends--Okay, I'm going to just briefly touch on this, but there are friends like Hailey in this world. Beautifully naive, and ignorant. I pity these types of people--and that's all I'll say. I was happy to have the dynamic anyway. Starr had friends from every playing field, and it made the story well-rounded. Chris. He was so necessary. His character was necessary. Essential. I don't want to say too much, because I want everyone to experience these characters and this story for themselves, but he was so necessary. I really don't want to make this review any longer than it is, but I can't say it enough about how powerful, and how important--and again, timely it is. This book is a stunning and poignant debut--that has the makings of necessary reading in any school. This is a great novel, that is well written while being completely down to earth, and relatable. Not only was it easy to read, and easy for me to relate to, on a personal level. I think even those so far outside of "this," type of story or lifestyle--will easily relate, or at least empathize. If you haven't picked up on it yet, this is must read--for any age, and any walk of life. Well done, Angie, well done. I am honestly floored by The Hate U Give. Everything about this novel touched me in irrevocable ways and I like to think that my eyes have been opened even further to the issues POC face, not only in America, but across the world too. From the very first page, I was completely engaged in the story. Angie Thomas is a phenomenal writer, relying on pathos to get her message across. And she certainly did. By the end of the novel, I was in tears and had so much rage inside of me, I didn’t know what to do. I have always tried to follow the Black Lives Matter movement in America, and my friends and I converse about racial issues (and many other political issues) all the time, but it’s still something that is foreign to me because I am white. I can read as much as possible, but I will never truly understand. But reading this book definitely helped and I truly believe it should be required reading for high school. Perhaps one day it will be. learnt so much from this novel, not just about the wave of systemic racism corrupting America, but also about the long history of POC fighting for basic human rights: the Black Panthers, Malcolm X, Dr King, Huey Newton, Tupac Shakur, and so many more. It was like getting a really interesting history lesson, and after the book was over, I spent a good hour Googling many of the people the novel spoke about. Before I get into the plot, I want to mention Angie Thomas’s incredible ability of writing realistic young adults – which, surprisingly, is not something you really see in YA. There’s all this pressure to make YA characters witty, mature, wise above their years – basically a John Green character – and it always annoys me how teenagers can’t just act like teenagers. But in The Hate U Give, the teens were normal kids who behave like normal kids and experience all the things normal kids do: dating, using Tumblr, laughing over memes, obsessing over Jordan shoes, binge-watching TV … it was just great to read about normal teens. Starr is perhaps one of my favourite YA protagonists now – I loved everything about her, from her confidence, to her fears, to her worries, to her self esteem. She is a fantastic YA character and a wonderful role model. I found her struggles between the rich, white world she was a part of, and the black neighbourhood she was from very compelling and complex. I think many people, irregardless of skin colour, can empathise with her inner battle: she has all this pressure on her to stay true to who she is, but at the same time, doesn’t want people to label her as the “angry black girl” if she states her opinion too strongly or says something too loudly. She’s exhausted and the reader feels her pain and exasperation. Starr has the absolute best family. I can’t even begin to explain my excitement at reading a YA novel with a functional, loving, whole family because it is so rare. I adored the loving relationship between her parents – Starr basically calls them her OTP, and they are 100% #couplegoals. I also loved the way Lisa and Maverick, Starr’s parents, treated their children with such love and respect: there were many scenes of the parents telling their kids how much they love them and how proud they are of them. It honestly brought me to tears. The family dynamics were written to perfection and was the bright light in this otherwise dark novel. As you would expect, the plot was just heartbreaking. Even though I knew what was coming, I still sat there praying that the events wouldn’t unfold like the blurb told me they would. I was terrified for each and every character in the novel, and just wanted them to make it to the end. But in the end, it sends a vital message in a hopeful way. I don’t want to say anymore about this book because the less you know, the more powerful your reading experience will be. All I can say is, read this book. It’s one of the most compelling YA contemporaries I have ever read. Angie Thomas has a long, amazing career ahead of her as an author, and I can’t wait to read her future works. This book is intense. I think it should be required reading in all high schools. Yes, I know there is a lot of swearing. But let's be honest. Kids hear it in school every single day. They hear worse. So please get past that. As a parent, I would have let my daughter read this in school. I would have encouraged it. This is such an important story. It covers black lives matter and 2 Pac. But it's so much more. It's a story about family, community, love, poverty, gang life, friendship, and activism. It's about having a voice and making a difference. I'm not doing this justice with my review. Just please go read this book. Needs to be read by everyone, especially teens.